Welcome, Holly...can you tell us what your inspiration was for Murder, She Rode? Tink's story was inspired by the fabulous Olympic sport of eventing and by an earlier generation of woman riders who rode with the risks and devoted their lives to developing the sport. Is the book a stand-alone or is a series planned? MURDER, SHE RODE is the first book in a series that will feature Tink Elledge and a variety of different horse sports, different kinds of horses, and different locations. Each of these mysteries will hinge on a technological or scientific puzzle. Usually Tink's third husband Charlie will be part of the action, but sometimes she will have to go it alone. Is the character of Tink based at all on yourself? Because Tink is such a good rider, I wish she were autobiographical. But if I have to be truthful, she is an amalgam of a number of terrific women in the horse world. What has been your life history with horses? When I was three, a girl rode up to our house on a horse. She was my babysitter of the moment, and my mother led me out to say hello. I don't remember very much about the girl, but my memory of the chestnut mare Flicka is crystalline. I demanded to be put on the horse, but the girl said no, the horse was much too frisky that day. That rejection sealed my fate. I wanted that horse. I would settle for a horse. But I wanted a horse. Nothing much has changed. Can you take us inside what goes on during equine three-day eventing? Eventing is a triathlon for horses and their riders, and it is every bit as demanding as the tri-s for humans. The horses compete one by one in dressage, cross-country, and show jumping, and these three phases demand horse-rider harmony, speed, and precision. In order to win, the horse and rider have to be good, very good, in all three phases. Sometimes perfection is almost enough. It's very exciting to be a spectator at an event. Nonstop motion and activity. It's a three-ring circus. Often there are more than one phase in action at the same time—and unlike being a spectator at a horse race, you can get very close to the horses while they're in action. Well. . .a horse, of course. 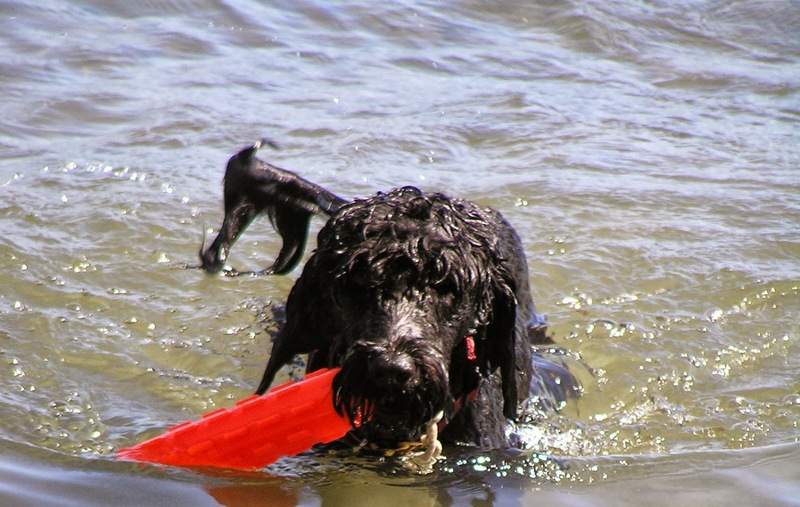 A Portuguese Water Dog, and a big, blond three-legged mutt. All of whom are the very finest examples of their kind! Would you like to tell us about the previous books you've written? I've published one earlier work of fiction, a novel for children called PANDORA, a nonfiction work that follows three horse trainers in the Olympic disciplines, and two works in natural history, DARWIN'S FOX AND MY COYOTE and CALLS BEYOND OUR HEARING: UNLOCKING THE SECRETS OF ANIMAL VOICES. There are lots more details about these books on my website (http://www.hollymeninobooks.com/index.html). I'm just finishing up the second Tink Elledge mystery, KILL DARWIN. In this story Tink, who was sidelined by an injury in Tink's debut story, is back on the horse for a hundred-miles-in-one-day horse race. What's in play at the same time is a struggle for control of a biotech firm, the intelligent design hypothesis, a corporate merger going sour, a death apparently by natural causes, and a death that is clearly unnatural. Giveaway: I have an extra copy of Murder, She Rode to give away. Please leave a comment with your email address, US entries only, ending 9/28. A former world-class rider and an adept horse trainer, Tink Elledge is a woman with a mission: to see her prized horse take home the victory at the prestigious Brandywine Three-Day Event. Tink is whip-smart, headstrong, and used to making her own way—so when an accident forces her onto the sidelines and causes her to forfeit the ride on what may be her last horse to a protégé, she struggles with the realization that her peak days as a horsewoman may be behind her. Then, before the event can begin, a truck accident kills a respected horseman and a talented colt. And when a young rider disappears, what began as a seemingly freak accident reveals sinister roots that lead directly to the tightly knit equestrian community and that Tink, in her newfound and uneasy role as a spectator, can’t help trying to uncover. During the three-day event, horses will perform with inspiring grace. Their riders will navigate treacherous obstacles. And Tink will unravel a plot that threatens the reputations—and lives—of the very men and women she hopes to defeat on the course. About the Author: Holly Menino has spent a lifetime living with and writing about horses. She is the acclaimed author of three nonfiction books who has been praised by The Washington Post for her "literate and lively style." But it is Murder, She Rode that showcases Holly’s immense talent as a storyteller and introduces an irresistible new voice in an engaging read. magnificent creatures. Love books about horses and this series sounds terrific! I like the animal collection. What are their names, I wonder? Great interview! Added this to my (seemingly neverendless) TBR. Love cozies and this one sounds great! I grew up with horses and my husband and I have 2 now that we rescued. I was raised on a farm, but my Dad and brother had horses. When I was old enough, I thought I should have my own horse. Dad bought me a horse that was so gentle, I could ride him without a saddle. Enjoyed the interview. Book sounds wonderful. Would love to win. Thank you for sharing and please enter me in this giveaway. 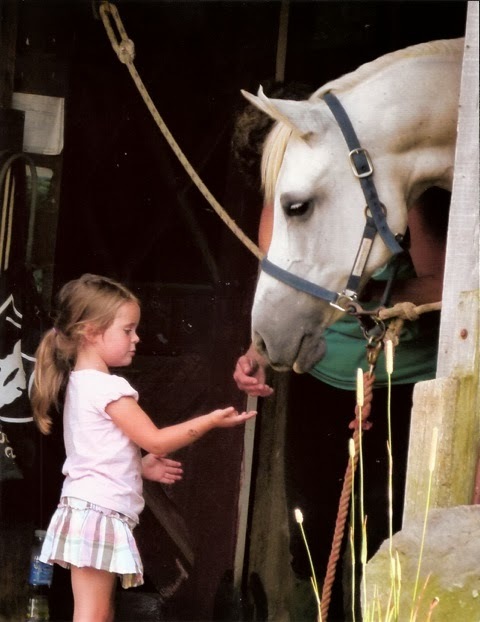 I spent my first 10 years on a farm and had my very own horse---then we moved and I've never had a horse again---even now in my retirement years I still long for that friendship with a good horse. I'd love to read this book. I'd love to start reading this new series! Thank you for the giveaway! This book sounds like a really good start to the series. I would really enjoy reading it. Please enter me. Thanks! I love horses and to watch these events. It is fasinating. Please I would love to win this book.